Photo supplied by Ultra Global PRT. If you want a taste of the future, head to Heathrow Terminal 5. We're not talking about Richard Rogers' swooping design, but rather something that's very easy to miss: a little fleet of self-driving cars. The Heathrow pods have been running since 2011 but they're tucked away as a shuttle between the terminal and the business car park. It's still a mode of transport in London, however — anyone can ride them. Just go to T5 and climb in for free. The destination may not be all that exciting but it's all about the journey — so when the operators asked us if we wanted to go take a look, we were all over it. The pods are electric and autonomous. You tell the system where you want to go using touchscreens at the station. If a pod isn't waiting, one will arrive quickly (the average wait time is less than 10 seconds) and you're off. They travel along guideway tracks, navigating laterally using a laser at each wheel so they don't bump into the barriers. And they're in complete control of the journey; the central system programs the route and its relation to other pods before it sets off, but once the pod is under way it's 'thinking' for itself. There is a manned control room if you want to speak to someone or if something goes wrong, but ultimately you're pootling along in your own little capsule and it's just cool. Which is all well and good, but 'cool' in itself doesn't explain 'why'. 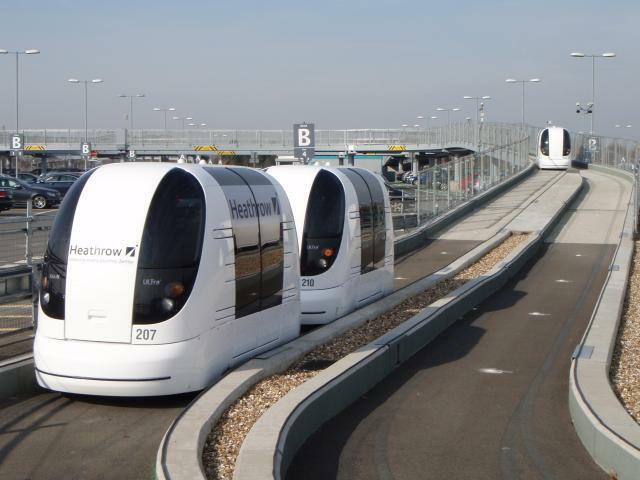 Heathrow wanted something to help it meet its emissions targets and the pod system replaces the hopper bus between the car park and terminal, removing the need for around 70,000 diesel-burning, getting-stuck-on-the-perimeter-road journeys each year. The pods are zero emission (though obviously how the electricity is generated to charge the battery packs is another issue). It's also completely wheelchair accessible. And other applications? Ultra Global PRT, who designed the system and now run it, think the main function for London is in 'last mile connectivity' — for example, it won't replace the Northern line, but once you're at Morden it could shuttle passengers off to different destinations, rather than a bus. Ultra Global also seem serious about looking into the possibility of using pods to 'extend' the DLR. They predict future systems could carry 2,500 people per hour per direction, which is exactly the same capacity as the cable car. And whereas the cable car cost £60m, the Heathrow system cost £30m (and future systems will probably cost less).